It is most probable that no photographs exist of the Handcross windmill which was located behind the Fountain Inn, now Fountain Mews. The above picture is only an example of a possible style and not of the Handcross windmill. The windmill in Handcross High Street was described as being a post mill with tail pole, painted white. Inside the building was a tall upright post on which the windmill is supported and pivots to catch the wind. The tail pole sticks out of the back of the windmill to enable the miller to push it round to face the wind, often with the assistance of a horse. Steps are usually placed at the rear to enable the sacks of corn to be carried into the windmill, and sacks of flour from the building. The steps are usually suspended above the ground and turn with the windmill. Select Open Document to view a history of the Handcross mill gathered from various sources by an historian. This was kindly supplied by Brenda Rowe. 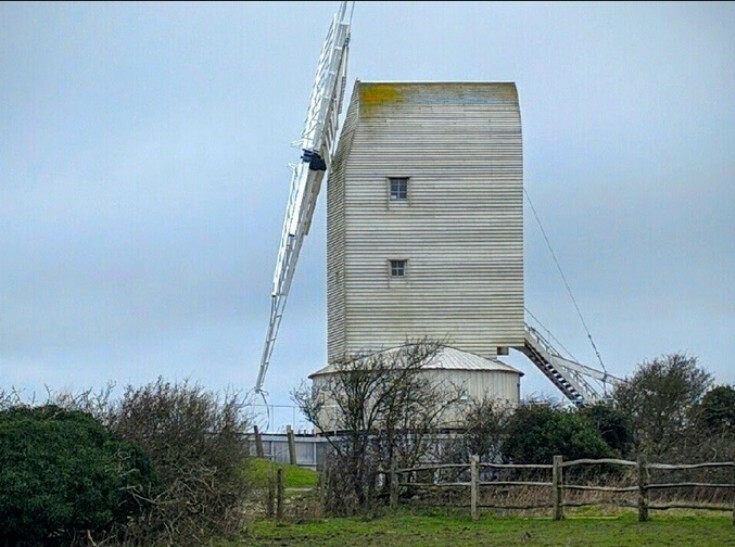 The windmill was seemingly built in 1814 and yet in 1926 it was described as “an old established mill”. Surely an estate agent would not exaggerate in the sales particulars! In 1839 it was described as located “one mile from the London and Brighton rail-road”. Miles were much longer in those days! The document quotes Rev. Budgen as saying that the windmill burnt down on one 5th November. In fact the author was Rev. Dengate who also states that in 1953 the amount payable for rates on the windmill was reduced from £19 to £15, and again in 1873 to £8 10s. I suspect this was symptomatic of a failing business. In the Tithe Map of 1842, William Nye was described as the tenant occupier of the windmill. Perhaps he had a change of occupation as the 1841 census described him as a bricklayer living in the High Street with his wife, Elizabeth, although his daughter, also named Elizabeth, was described as an apprentice miller. It is difficult to read but a copy of the census can be found by selecting Large Version. John Agate is mentioned as being a miller and farmer in Slaugham in 1858. As he and his family lived at Slaugham Place, he would have been the miller at the watermill located on the bank of the Mill Pond. Around that time, the occupant of the nearby Mill House was Joseph Botting who was described as a mill loader, presumably pouring the grain into a hopper above the grinding stones. More history of the Slaugham Mill can be found at picture #768 and picture #769. The notes in the document attached above were compiled by Herbert Edward Sydney Simmons (1901-1973). His biography on the Mills Archive site states: "He was from Sussex and worked at the Ministry of Defence. He toured Britain extensively from the 1930s onwards, photographing and recording mills. His aim was to put in writing everything to do with mills in the British Isles, and he amassed a vast collection of material. He produced and sold postcards of his mill photos".